More than sixty mammal species live in Estonia besides man. Our rich animal world calls for attention. So let us begin, and why not with the clever wolf, the animal who arouses many conflicting feelings. Cautious, rarely seen, secretive – information efforts are clearly called for throughout the year. To explain what happens in nature to modern urbanised man, simply yet accurately, is a tough challenge. We no longer have everyday relations to field and forest life. In order to describe the ecological relationships we need appropriate examples and images. The wolf is as if made for this – its role in nature is singularly thought-provoking. As other large carnivores, the wolf helps to maintain healthy populations of animals. It is not called forest sanitarian in vain. 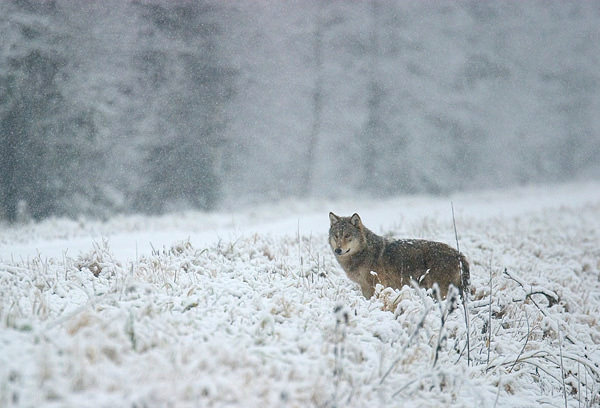 The animal of the year was elected by Eesti Terioloogia Selts - Estonian Theriological Society, Looduskalender, Looduse Omnibuss, Eesti Looduskaitse Selts - Estonian Nature Conservation Society, Eestimaa Looduse Fond - Estonian Fund for Nature, Eesti Metsaselts - Estonian Forest Society, Tallinna Loomaaed - Tallinn Zoo, Eesti Loodusmuuseum - Estonian Museum of Natural History, and journal Loodusesõber. And the darkness only sheltered him.